The canal formerly ran along here but was moved closer to the mill as a water supply source. John Dickinson & Co John Dickinson (1782-1869): Inventor, engineer, architect, builder, manager and financier, John Dickinson spent more than 60 years in the trade. 1797 John Dickinson was almost 15 when he was apprenticed to stationers Thomas Harrison of Leadenhall Street, London. 1804 John Dickinson set up as a stationer in the City of London at Walbrook 1807-1847 He applied for 14 patents relating to paper. 1809 He developed a patent process for machine-made paper utilising an ‘endless web’ which was an ingenious perforated cylinder of metal with a finely woven wire covering. This revolved in a vat filled with pulp and produced a continuous sheet of paper. From this time right up to 1855 he took out dozens of patents. 1809-1830 Rapid expansion, as John Dickinson first bought '''Apsley Mill, Hemel Hempstead (1809)''', followed by Nash Mills (1811). 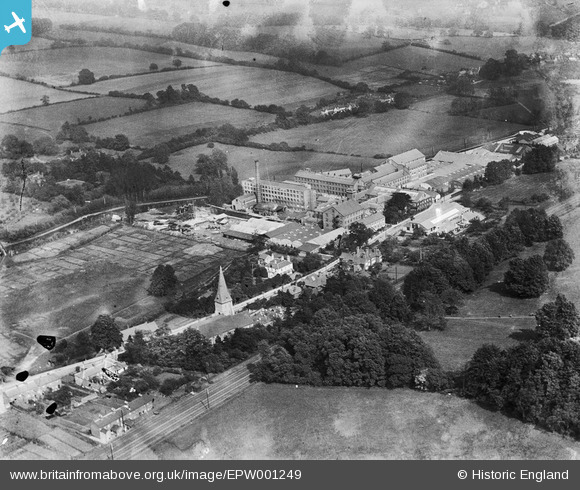 He then built Home Park Mills near King's Langley (1825) and finally bought Croxley Mill near Watford (1830). He also established "half-stuff" mills at Batchworth and Manchester. He invented a new kind of paper for cannon cartridges. This type of paper did not smoulder after the cannon had fired, which had been the cause of constant accidental explosions in the artillery. Until his time, paper was produced using rag and esparto, instead of the now conventional wood pulp. Dickinson patented his invention, and it was taken up by the army. It was said to have been of great value in the battles against Napoleon, increasing the British firing rate while simultaneously reducing premature firing accidents. 1809 - Dickinson entered the business of paper manufacture when he acquired his first mill (a converted old corn mill) in the valley of the River Gade in Hertfordshire. He had bought paper from George Stafford of '''Apsley Mill''', Hemel Hempstead and purchased Stafford's mill in 1809. 1813 - a bad fire destroyed nearly all the mill 1830 - a gang of machine makers from the 'Swing Riots' marched upon the mills on the Gade Valley, but turned back when confronted with Dickinsons hurriedly gathered defence force. 1850 Mechanical envelope manufacture started at John Dickinson, producing its first gummed envelopes. 1869 John Dickinson died. By 1876 his company was producing 3 million envelopes per week. 1910 Lion Brand adopted as the company logo; 1918 Millington and Sons acquired, originators of Basildon Bond. Brand established 1911 1929 John Dickinson pioneered production of window envelopes. 1937 John Dickinson pioneered production of Latex Seal Easi envelopes 1951 Production of Continuous Stationery established at '''Apsley''' 1963 New 250,000 sq ft stationery factory opened at Apsley 1992 Acquired by Bowater '''1999 The company left Apsley Mills and relocated to Cambridgeshire.''' The former '''Apsley Mill''' site in Hemel Hempstead is home to the Paper Trail, a museum which incorporates a narrowboat ride along the Grand Union Canal and the River Gade to Frogmore Mill, viewing of a working paper machine, producing recycled board and paper, as well as handmade paper making and paper sculpture. The Frogmore Mill exhibits are also open for direct visits. Sources: http://www.gracesguide.co.uk/John_Dickinson_and_Co http://johnevans.ashmolean.org/evans/dickinsons.html wikipedia - [[John Dickinson (inventor)]] and [[John Dickinson Stationery]] Further reading- the book by Joan Evans, "The Endless Web, John Dickinson & Co Ltd 1804-1954" (1955) was printed on paper made by the company. Second hand copies are easily located. 1953 advert from http://www.gracesguide.co.uk/John_Dickinson_and_Co under Creative Commons Attribution licence.